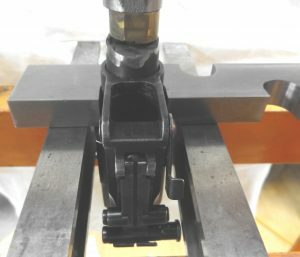 This particular rifle has a bipod installed so the short support block (to the left of the bipod collar) is placed between the rear of the front sight and the plate. There is the occasional rifle that is missing the bipod collar and a slot is provided to remove the front sight block from such rifles. The brass pad seen is just a piece of scrap I use to protect the press ram. The Yugoslavian M72 has a gas block assembly that is a serious challenge to safely remove since it has “ears” that contain the sling swivel. A similar gas block design is found on the Yugoslavian M70 as well as the milled Bulgarian AK 7,62 x 39,0 rifle. The additional tool GS-0003-B is a split sleeve that is designed to support the gas block at the “ears” and allow it to be safely pressed off. 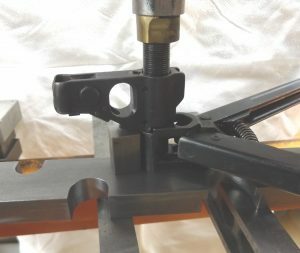 This tool is held in place with a simple worm clamp. The additional tool GS-0003-C is a simple 5/8″ x 5/8″ x 6″ steel bar that provides additional support for this delicate operation. The Yugoslavian M72 has a narrow space between the rear sight block and the breech block that provides little room for good support while removing the rear sight block. The GS-0003 has a counterbored slot to accommodate this narrow space and provide critical support. I will add that the GS-0003 can be flipped over if the user wishes to press out a complete barrel assembly. 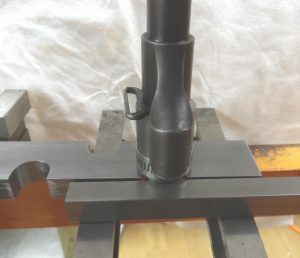 For most builds the breech block is removed from the rifle in order to perform needed repairs or set headspacing with a new barrel or bolt, etc. and that is the example provided here. 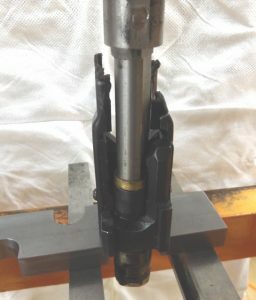 The barrel could be removed from the breech block while it is assembled with the receiver but this would require the use of a barrel pushing tool that is not shown here. The counterbored slot is the one used for this purpose and the GS-0003 is flipped over in these photographs. Also seen here is tool GS-0008 with a GS-0005-D1 brass pad that protects the chamber face.